A large historical marker stands at the corner of Faculty Drive and Timberlake Lane, just across the street from where Wake Forest University’s Department of Biology is housed inside Winston Hall. The words “Welcome To Historic Wake Forest Neighborhood – Est. 1956” are etched into the metal historical marker, which has been painted old gold and black like other signs posted around campus. Just past the marker, one- and two-story houses line the five quiet streets that make up the neighborhood. The houses range in style, with some exteriors made of brick and others covered with wood. Large trees in each yard provide both shade on a hot afternoon and a limb for the occasional tree swing. Martha Allman, WFU’s Dean of Admissions, got a sense of the neighborhood during her four years living on campus as an undergraduate student. Her freshman advisor had a house on Royall Drive and hosted a dinner for students during Orientation. “I had this very idealized feeling about that neighborhood and how wonderful it would be to live there,” Allman said. In 2001, Allman and her husband moved their two young daughters into a yellow house on Faculty Drive. Their neighbors include a “Who’s Who” list of WFU administrators, professors, and staff members who also enjoy living on campus, walking to work, and hosting students in their homes. 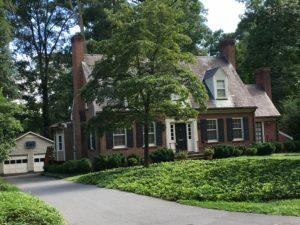 The Historic Wake Forest Neighborhood was started the same year WFU moved its campus to Winston-Salem as a place for faculty who had relocated to live. It has since grown into a tight-knit community where dozens of university employees have raised their children just down the street from Wait Chapel for more than 50 years. “Over here faculty members are our next-door neighbors, and the fact that one faculty member was a historian, another one was a psychologist, another one was a physicist, that’s tremendously important,” said Ed Wilson, the longtime English professor and Provost who is affectionately known as Mr. Wake Forest. Wilson still lives in the same four-bedroom house that he and his wife, Emily, built on Timberlake Lane in 1964. He raised his three children there. He can still remember the different routes he used to walk every day to reach his favorite spots on campus, including his office in Tribble Hall. “I walked up Timberlake Lane, took a left at the top, went down to where the entrance of the Fine Arts Center is or took a right to the top and headed toward Wait Chapel,” Wilson said. Professors can often be seen walking with their families along the neighborhood’s tree-lined streets on their way to attend a lecture, concert, or sporting event on campus. When the university was closed one day because of heavy snow, Allman invited the three members of the Admissions Office who also live in the neighborhood to her house for chili. “I think some people feel like ‘I want to leave Wake Forest at the door at 5 o’clock,’ and I think you can,” Allman said. “It’s certainly not a situation in which there’s something going on every night that’s Wake Forest-related in the neighborhood and people knocking on your doors and students there unannounced. Still, the neighborhood’s close proximity to the buildings on campus has provided students with a unique experience with faculty members. Professors have been known to hold classes in their living rooms and make home-cooked meals for their students. “When I have been an advisor and I host the advising dinner, I don’t have to worry about how the students are going to get to my house,” said Christy Buchanan, Senior Associate Dean for Academic Advising who lives in a four-bedroom house on Faculty Drive. Andrius Galisanka, Assistant Professor of Politics & International Affairs, got a feel for the neighborhood during his first few weeks in Winston-Salem when he and his wife stayed with his colleague, Politics Professor Michaelle Browers, on Faculty Drive. Browers is now a neighbor who lives just down the block from Galisanka and his wife, who purchased a three-bedroom house at the end of Faculty Drive in 2016. It is where they are raising their 3-year-old son, Marty. The neighborhood appealed to Galisanka and his wife, in part, because it was so close to his office in Kirby Hall he could walk to work. The family would not have to buy a second car. They also ate almost every day at The Pit while they were renovating their kitchen. Each house in the neighborhood is commonly referred to by the original owner’s last name. There is the Hooks House named after former WFU Athletic Director Gene Hooks. Buchanan lives in the Drake House, built by former English Professor Justice Drake. “I have such great memories of growing up in the neighborhood,” said Rosalind Tedford, Director of Research & Instruction at ZSR Library and the daughter of former WFU Theatre Director Harold Tedford. She was around age 6 when her parents moved the family into the house they had built on Royall in 1974. She spent her childhood on WFU’s campus, playing with other faculty members’ kids and helping to make homemade praline for the neighborhood during Christmastime. Tedford and her husband decided to move back to the neighborhood in 2013 after her daughter, Erin, was born. They purchased a small house at the end of Faculty Drive and later moved into her childhood home on Royall when her parents decided to downsize. 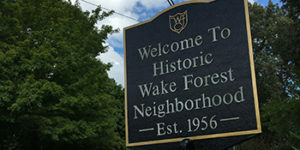 WFU faculty and staff who may be interested in moving to the neighborhood should monitor the following page (https://properties.wfu.edu/historic-wake-forest-neighborhood/) where updates on available houses are posted.